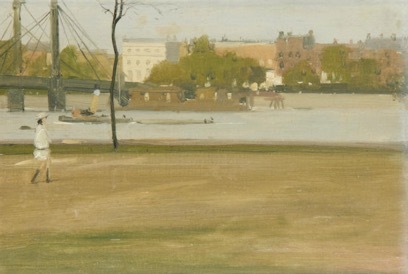 Sir Herbert James Gunn RA PRP RSW (British, 1893-1964), View of the Thames and the Albert Bridge from Battersea Park, oil on board 25.5 x 35.5cm (10 1/16 x 14in). This painting by Sir Herbert James Gunn was stolen from the Fine Art Society in London who was then paid out by their insurance company after the loss. Years later, the painting appeared for sale at a major London auction house who subscribe to a private, for-profit database company for due diligence services. While this database company claims to recover lesser-known artworks on behalf of their clients, their actions in this case showed them to be seriously ethically challenged. First, the Chairman of that organization, sensing this was a low value recovery (small fee for them), ordered a staff member to “kill the case” which included failing to notify the theft victim, the insurance company, and law enforcement. It was their intention to let the painting sell to the highest bidder despite the title claim. This is one of the inherent conflict issues in running a database company that services auction houses while amateurishly attempting recovery efforts on behalf of victims. Fortunately, the loss adjuster representing the Insurer contacted Art Recovery International and requested assistance. Christopher Marinello contacted law enforcement and reached out to the auction house who put him in touch with their Consignor. After about an hour and 20 minutes, the Consignor was convinced by the documentation provided by ARI to sign a simple Release form, walking away from the title dispute. The painting was then returned to the loss adjuster at a local pub (don’t ask) and eventually returned to the theft victim. Recovering stolen art is not always difficult but it can be if you don’t make the effort.